Something happened this morning that made the hair stand up on my arms. I got to listen in on the student meeting that was held in February 1969 in the Physics Amphitheater after William H. Masterson was announced as Rice’s new president. It was breathtaking. I understood it. You can pick out Warren Skaaren instantly–he had a Minnesota accent! Bari Kaplan was astonishingly articulate. In fact, the strong first impression I took from the whole thing was just how articulate all of the undergraduate speakers were. They spoke in paragraphs and sounded like adults. I’ve known for twenty years that there was a tape called “Masterson–Mass Student Meeting” deep in the ktru collection but I never had any way to listen to it. Then this summer the station’s general manager, Will Robedee, gave the Woodson an old piece of equipment, a reel-to-reel tape player. We sent it out for a bit of refurbishment and with the attention of several Fondren staff members it was set up in our Digital Curation Lab down in the basement. (I won’t pretend to understand how this was done.) Today we put on the tape and turned everything on. What a strange feeling–a mix of elation and unease. It’s going to take quite some time to really work through it all. I can’t wait to get started. Wow. Reel-to-reel restoration is quite an art. Must have made your day. It probably made my fall semester! That looks like (maybe) Audacity on the computer screen, so I’m sure this station will do conversions. Is that something the Woodson offers as a service to local museums/historical orgs for a fee? Just wondering. We used reel-to-reel for recording interviews when I was at KTRU. It is a little weird for that to be a special format that only a few facilities can read. There is some great stuff in the KTRU archives. The interviews I did would not be in that category. Might an audio file be available on your website someday? I would love to hear this…I think I was there, or perhaps it was a later protest gathering. But I remember those days pretty vividly. “Marat/Sade” was being put on by the players and I sold tickets to get in free. I remember those archives which were up on the wall in the KTRU office when I was at Rice (1976-1982). I seem to remember there was a copy of the Kennedy speech up there too. (I always wondered where it came from since KTRU didn’t exist in 1962). I never got a chance to listen to it. Do you have it? When I was at KTRU there were lots of reel-to-reel decks. I remember at least 4. One was specially set up to be the “telescope” recorder. You would set it up to record, and it would be triggered when someone pressed the button to enable the mike in the main studio. It was mostly meant to help new DJ’s listen to how they sounded without having to fast forward through all the music in between. I used it once to catch a misbehaving DJ who was swearing and criticizing KTRU staff on his overnight (1:00 to 4:00 am) radio shift. The KTRU archive contents are listed here. They do have “JFK #1” and “JFK #2”. They also have telescopes for David Tuttle and Grungy. If you need another reel to reel, we have one stored in a closet. It would be good to put it to use again. For those who are curious, yes, reel-to-reel was the standard for best-fidelity audio recording until the advent of digital recording. You will find plenty of support in the audio world, in fact, for the opinion that digital recording is still inferior to reel-to-reel. However, digital’s convenience and ease of editing have meant that it is now universal except in a few specialty recording facilities. In practical terms, that means that surviving reel-to-reel decks, most of which are at least 30 years old, are difficult to keep working at top condition. Repair parts and wear items like rubber belts are hard to find. 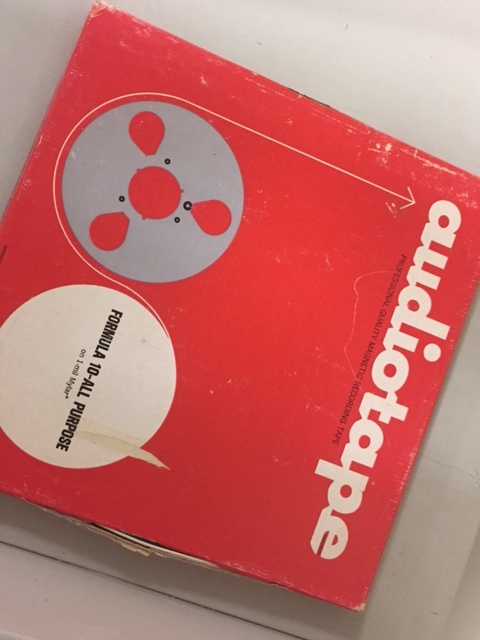 Additionally, the tapes themselves (especially AMPEX if they were not stored with good climate control) will delaminate their magnetic media from the mylar backing. These tapes have to be baked at low heat to reactivate the adhesive, and can then can only be played once for a transfer. 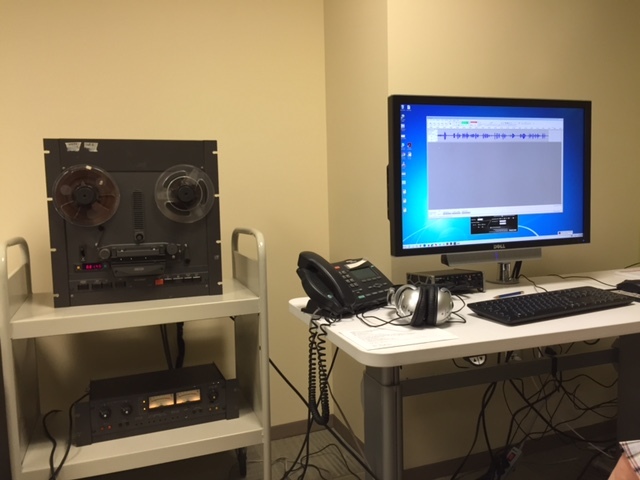 The whole question of reel-to-reel audio archive management is a big deal in the library world. I know that Mary Brower has spent a lot of time on that for Shepherd School recordings. You can find some reel-to-reel audiophile activity here. They are reissuing a few classic albums on 1/4″ half track tape. My ‘little bride’ has some Nat King Coles that she would probably sell for much less than $450. 78s, 45s, 33 1/3s, digitals, and an antique piano songbook with chord notations. In the books, not my wife, I’m keeping her!